The Roll Boost offers transparent boost when you need it at a budget price and is doubles as a viable alternative to an overdrive pedal for valve amps. Blimmin' excellent. Compact size; simplicity of use; tonally transparent; great for driving valve amps. 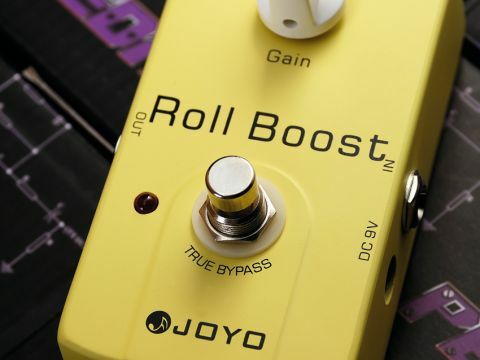 As basic a pedal as you're likely to see, the Roll Boost (shouldn't that be Rock 'N' Roll Boost?) offers up to 35dB of boost via class A circuitry, the amount being set by a single gain knob. At minimum on the knob you get no boost whatsoever, so advancing it clockwise gives you a very workable range, from subtle upwards, for increasing the gain without changing your amp's tone. Tried out with a Fender amp on a clean setting, we were able to drive the valves further and further to a great natural overdrive at full boost.